Spondylolisthesis known as a slipped disc is a spinal condition in which one vertebra slips forward. 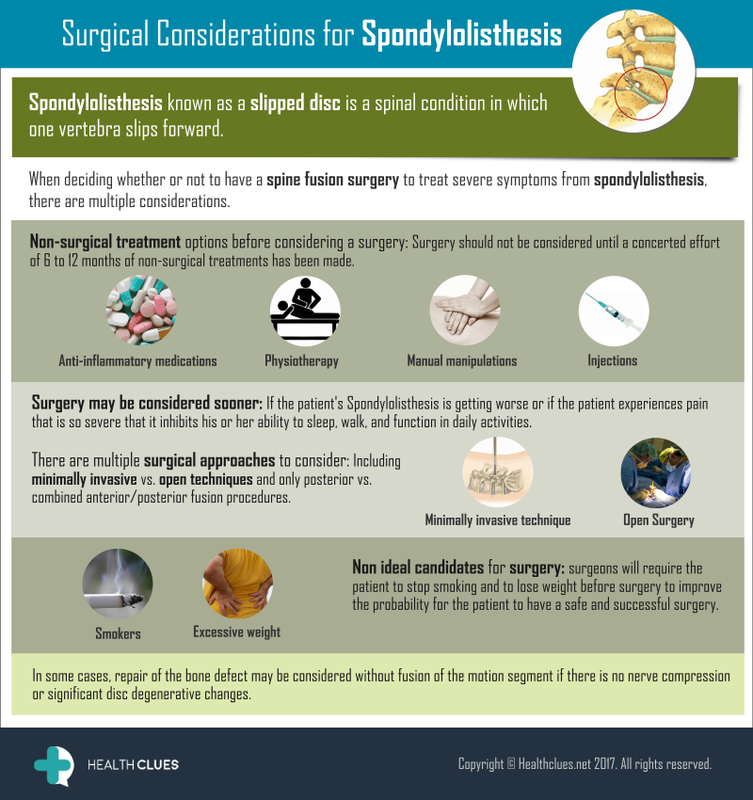 When deciding whether or not to have a spine fusion surgery to treat severe symptoms from spondylolisthesis, there are multiple considerations. Non-surgical treatment options before considering a surgery: Surgery should not be considered until a concerted effort of 6 to 12 months of non-surgical treatments has been made. Surgery may be considered sooner: If the patient’s Spondylolisthesis is getting worse or if the patient experiences pain that is so severe that it inhibits his or her ability to sleep, walk, and function in daily activities. There are multiple surgical approaches to consider: Including minimally invasive vs. open techniques and only posterior vs. combined anterior/posterior fusion procedures. Nonideal candidates for surgery: Surgeons will require the patient to stop smoking and to lose weight before surgery to improve the probability for the patient to have a safe and successful surgery. In some cases, repair of the bone defect may be considered without fusion of the motion segment if there is no nerve compression or significant disc degenerative changes. Infographics, Spine Surgery back pain, Minimally invasive technique, slipped disc, spine surgery, Spondylolisthesis. permalink.